TRAINS THAT WOULD SKIM TRACKS AT HIGH SPEEDS PROPOSED IN DARING TRANSPORTATION SCHEME IMAGINE a flying railroad in which captive airplanes serve as cars. 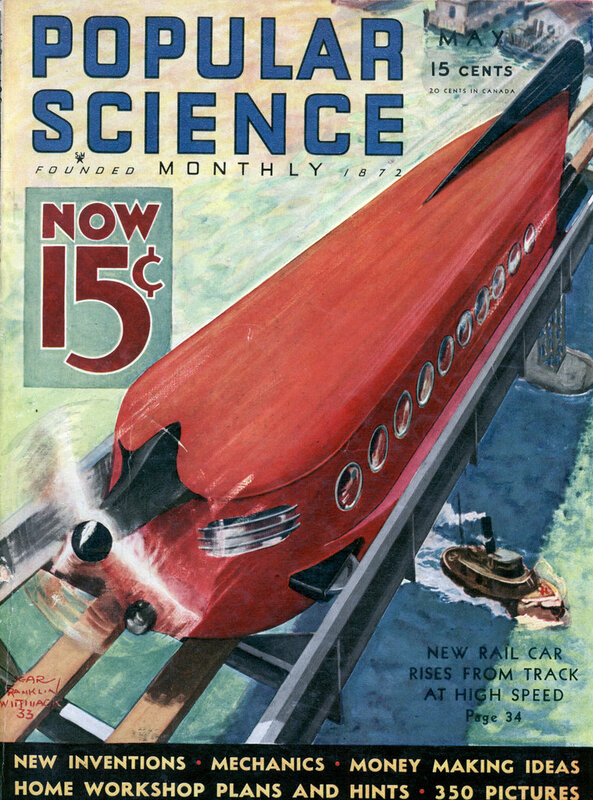 Skimming through the air, the streamlined cars are expected to attain speeds up to more than 200 miles an hour. A cage of rails restrains them from actually leaving the track. That is a brief outline of a project for a high-speed transportation system put forward by a New York engineer, Walter H. Judson, pioneer aviator and formerly chief engineer for a railway car manufacturer. In Judson’s opinion, all engineering details have been worked out. With the cooperation of makers of railway and electrical machinery, structural steelwork, and airplane equipment, he has prepared a complete plan. Judson’s plan calls for a light-weight structure of steel with a roadbed of trough-shaped cross section. Two bottom rails will be faced with rubber; these will support the flying car, with its pressed-steel wheels, while it lightens itself with increasing speed. A pair of side rails will serve as buffers and prevent sidesway. L-shaped rails at the top will complete the cage and prevent the car from lifting itself completely from the track. The fifty-foot coach, encased in a streamlined shell of light metal alloy, will resemble an airplane fuselage shorn of wings. Wind-tunnel tests show, Judson says, that the curvature of the roof provides sufficient lift at full speed to raise nearly all of the car’s weight from the rails. Guide wheels with rubber tires are expected to restrain the car if it should leave the rails entirely, while similar wheels limit sideward movement. 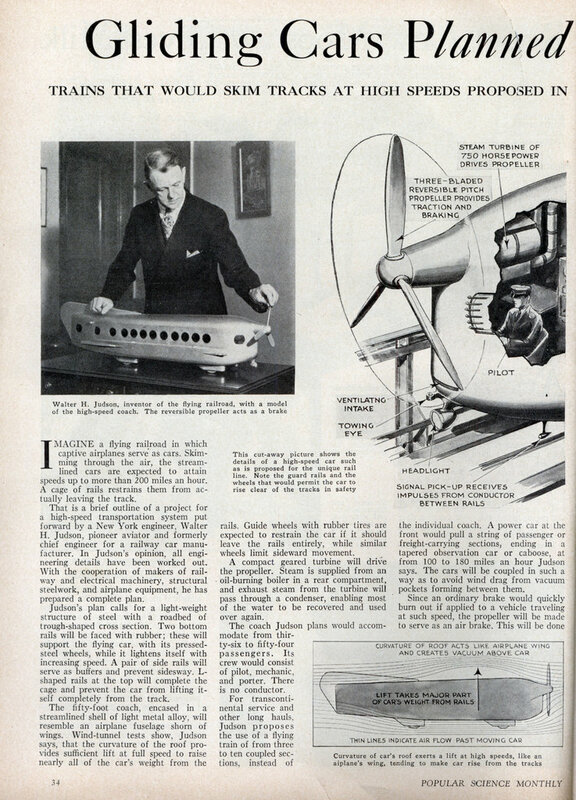 A compact geared turbine will drive the propeller. Steam is supplied from an oil-burning boiler in a rear compartment, and exhaust steam from the turbine will pass through a condenser, enabling most of the water to be recovered and used over again. The coach Judson plans would accommodate from thirty-six to fifty-four passengers. Its crew would consist of pilot, mechanic, and porter. There is no conductor. For transcontinental service and other long hauls, Judson proposes the use of a flying train of from three to ten coupled sections, instead of the individual coach. A power car at the front would pull a string of passenger or freight-carrying sections, ending in a tapered observation car or caboose, at from 100 to 180 miles an hour Judson says. The cars will be coupled in such a way as to avoid wind drag from vacuum pockets forming between them. Since an ordinary brake would quickly burn out if applied to a vehicle traveling at such speed, the propeller will be made to serve as an air brake. This will be done by reversing the pitch of the propeller blades so that they push the air ahead of the car and retard its motion. When the vehicle has thus been slowed to ninety miles an hour, steam-operated brakes will be applied to I-beams at the sides of the trough and bring the car to a halt. A full stop from a speed of 200 miles an hour can be made in 7,800 feet, Judson calculates. An automatic signal system, he says will make it impossible for one car to approach closer than three miles’ distance to another. When a danger signal is picked up electrically from an inductor cable running along the center of the trough, the propeller blades will reverse of their own accord and the steam brakes operate after the proper interval. If any foreign object falls into the runway, an emergency signal is automatically flashed to oncoming cars and the usual action of the propeller brake is accelerated. The pilot has no signals to watch, but can talk with other cars and with the train dispatcher through a “wired wireless” system using the same conductor that carries the signals. These safety features and the absence of any grade crossings greatly reduce the chance of accident, Judson believes. Windows will be sealed and fresh air provided by an air-conditioning system with an inlet at the front of the car. Judson announces that a fifteen-and-a-half-mile demonstration line is planned for New Jersey, to serve a community as yet unnamed. Both coaches and trains will be run according to the plan, and will make the trip to a terminal connecting with a New York ferry in six minutes. Commuters and sightseers, Judson says, will be offered an opportunity to use the line, although its principal purpose is to show the feasibility of the system for larger-scale application. He declares its use would bring Chicago within five and a half hours of New York City, and San Francisco eighteen hours from New York. First of the longer runs contemplated by Judson for his system are lines connecting Jersey City and Atlantic City, N. J., with Philadelphia, Pa.
That somehow seems very safe and incredibly dangerous at the same time.